On May 19, 1910, the Earth passed through the tail of Halley's Comet. This is one of the closest contacts between the Earth and any comet in recorded history. As a result of expansive newspaper coverage, the pass of the comet was anticipated by the public. Aside from the facts, the event was anticipated with dire predictions and seen as a sign of “impending doom”. Some of the fears relating to the comet’s passing included that the comet’s tail contained poisonous gas and that there would be a celestial collision. 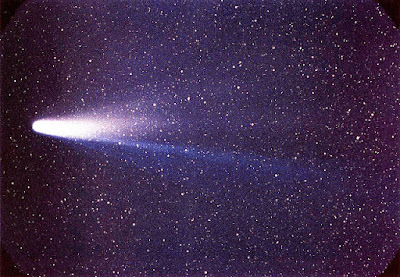 Halley’s comet was named for the British astronomer Edmond Halley who was the first to determine its orbit and accurately predict its return to the Earth's night sky. He published "A Synopsis of the Astronomy of Comets" in 1705, which cataloged 24 comets that appeared near Earth between 1337 and 1698. His observations based off of historical records led Halley to propose that the comet may continue to visit Earth. The comet appeared in 1531, 1607 and 1682 and as of such, Halley suggested the same comet could return in 1758. Halley died in 1742 before the comet returned.